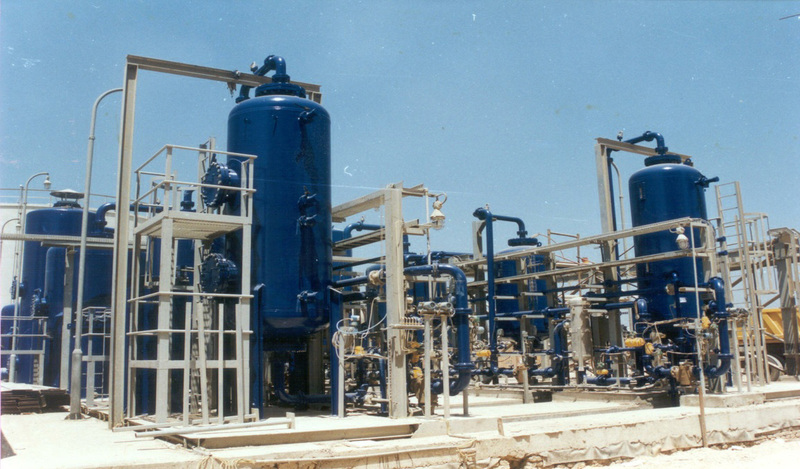 Naptha Hydrotreating Units responsible for decomposing organic sulfur, oxygen and nitrogen compounds that can cause poisoning for the catalysts of Platforming and Isomerization units. In addition, hydrotreating removes organo-metallic compounds. 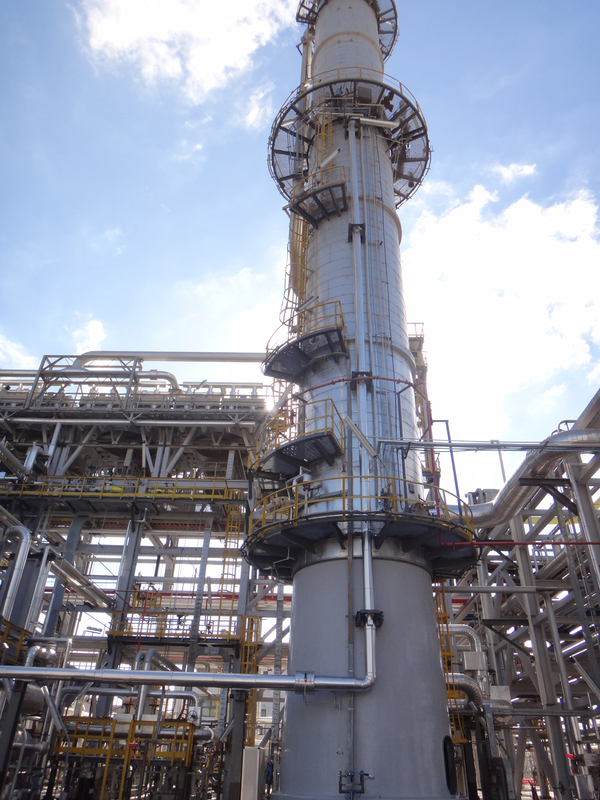 These processes take place by employing a selected catalyst and hydrogen stream to the straight run naphtha at suitable temperatures and pressures. The catalyst used is alumina base impregnated with compounds of cobalt or nickel and molybdenum. In that section all chemical reactions take place. This section gets rid of sour gases, LPG and water. Cleaned naphtha is directed to splitter section. Sour gases are sweetened and used in firing heater of New NHT. 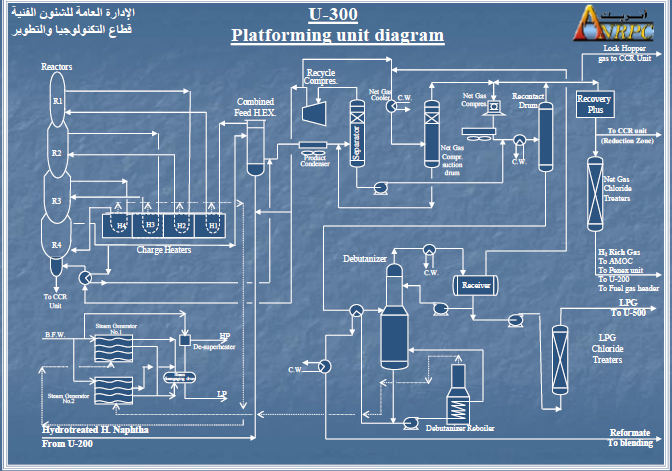 Sour LPG is treated with amine and directed to Alexandria Petrolum Company as a final product. 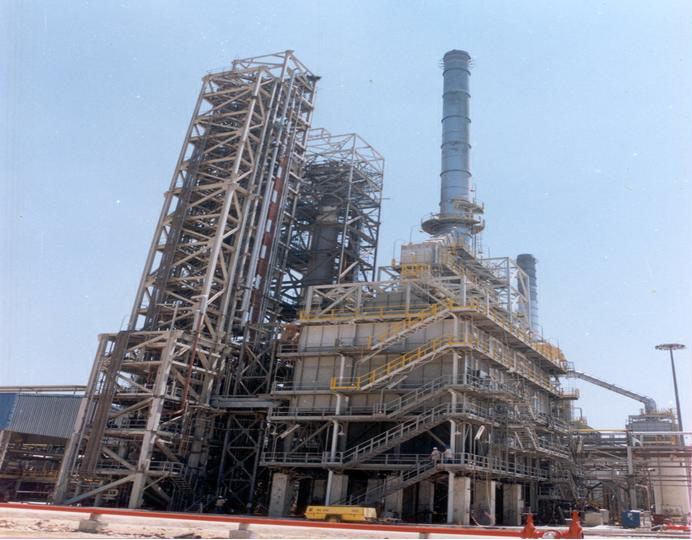 This section responsible for separating the treated naphtha as light naphtha and heavy naphtha. 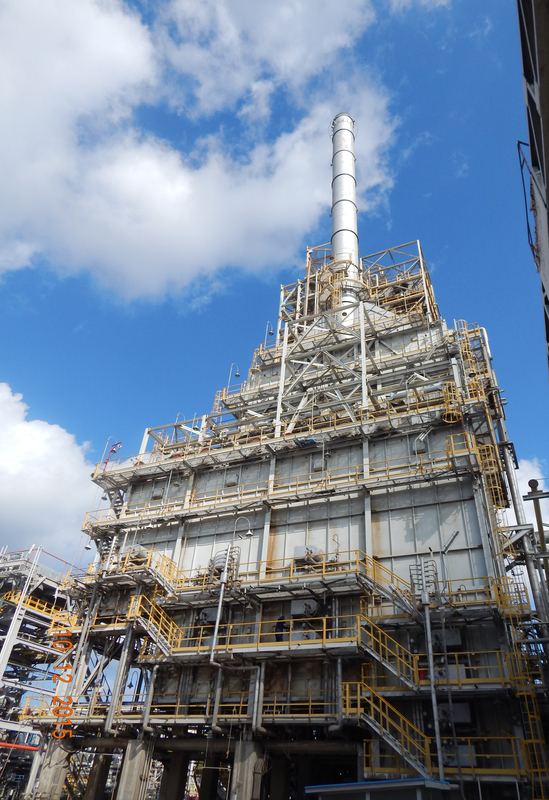 The Light Naphta directed to Isomerization Unit and the Heavy Naphtha directed to Platforming Unit. 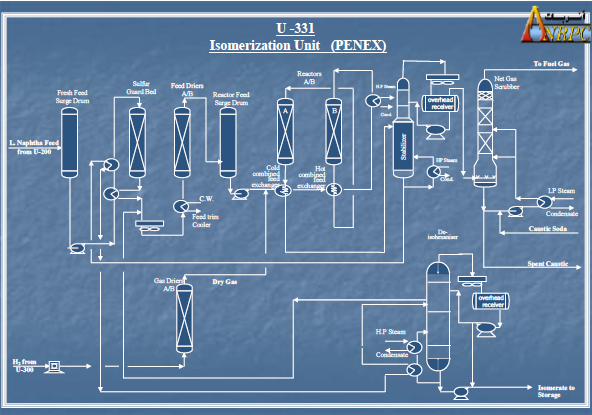 The unit is designed for catalytic isomerization of light naphtha (mixture from n- pentane & n- hexane) in the presence of hydrogen atmosphere over fixed bed catalyst at operating conditions which promote isomerization reaction and minimize hydrocraking to produce high octane isomerate. The major equipments in penex unit are: sulfur guard bed. Liquid and gas dryers, reactors, heaters, reboilers, exchangers, product stabilizer, caustic scrubber and de-isohexanizer (DIH). main reactions are :Conversion of n-pentane to iso-pentane and Conversion of n-hexane to its different isomers. Feed light naphtha from NHT units about 479000 ton/year. with out any chemical additions (TEL ,MTBE ). catalytic reforming improves anti-knock properties of gasoline and minimize the coke deposit on the catalyst . platforming reaction takes place in presence and hydrogen environment and proper catalyst (40P R -164) . the catalyst has two functions acid and metallic function to improve dehydrogenation and dehydro cyclization reaction and minimize hydrocroking reaction. Unit feed Sweet heavy naphtha from NHT unit (476000 ton/year). Hydrogen 33600 ton/year with purity 97.5% which distributed to the process unit , AMOC, E-LAB,APC and the excess use as fuel gas (the excess hydrogen will used as feed to ammonia complex). 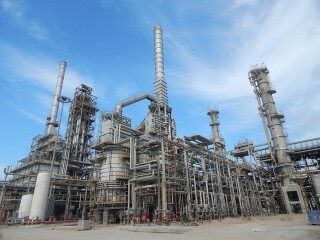 the catalyst regeneration section consist integrated equipment and connected to the reaction section in platforming unit . 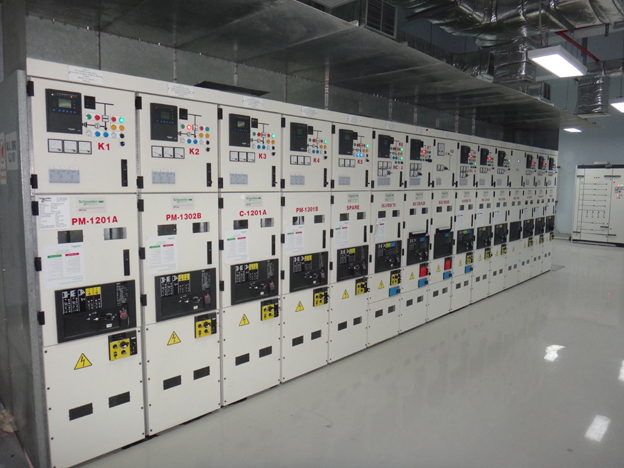 Recovery plus unit consist & three operation circuite . increase the production of liquid yield. increase the rate of production for butane( LPG). increase the purity of hydrogen to 97.5%. 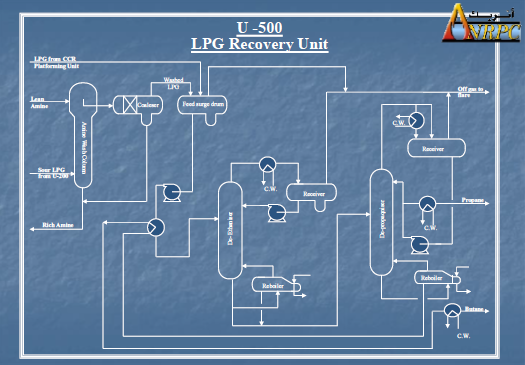 Purpose of this section is responsible to treat LPG from acid gases (H2S) using solution from diethanol amine. 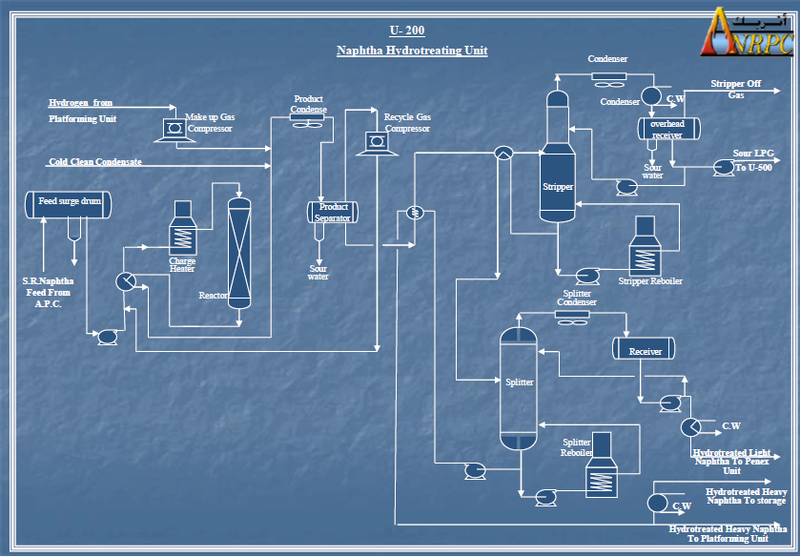 Purpose of this section is process light hydrocarbons (C1-C4) into the required compounds .the section is designed to separate feed stream into off gases (C1&C2) through deethanizer column and propane &butane (C3&C4) through depropanizer. 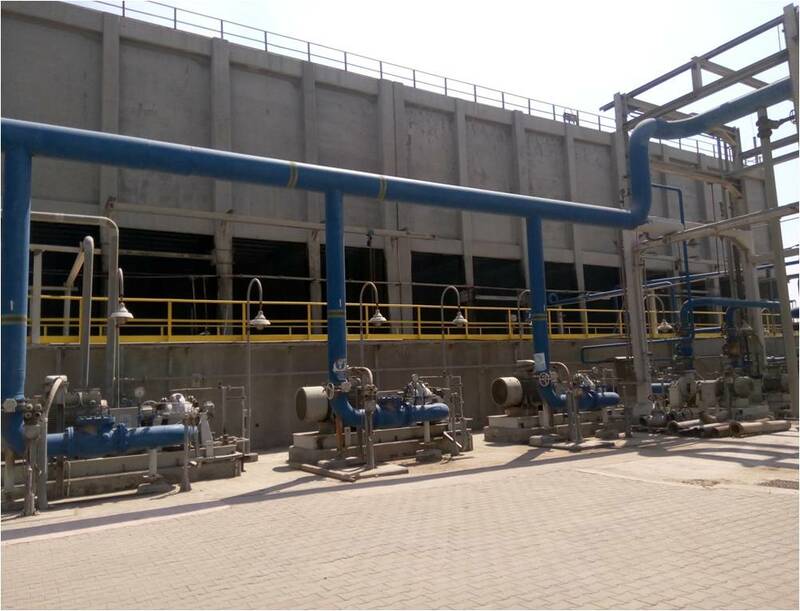 The design capacity of steam generating boiler is 100 Tons/hour to fulfill the needs of both ANRPC and Alexandria Petroleum Company. And also enough for the future projects f the company. 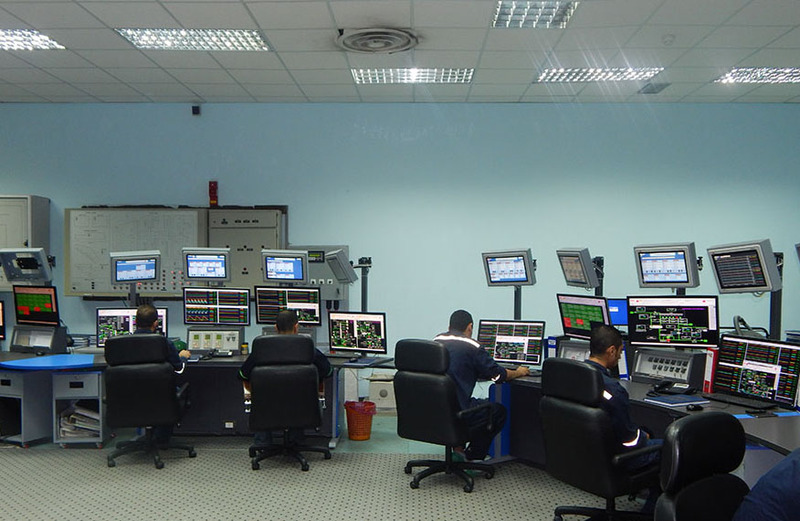 The most advanced systems are used for automatic control, alarms, and emergency shutdown via a digital Distributed Control System (DCS) depends on the newest technology of that field. 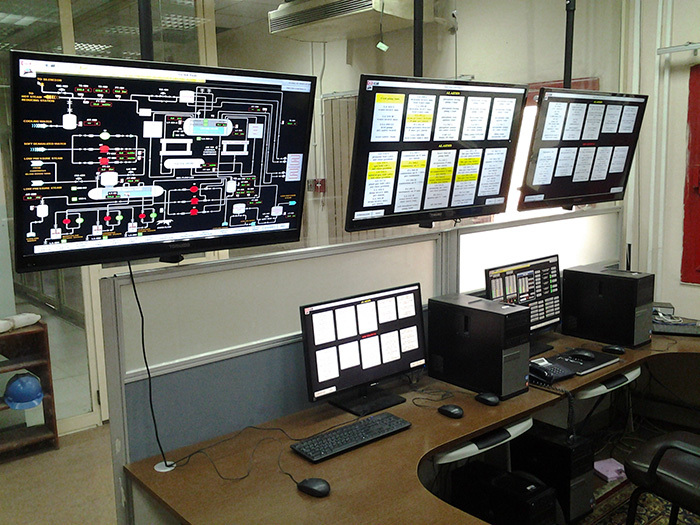 Also using Advanced Process Control and Optimization system. A closed cooling system to cool products and machinery. Depending on reusing the coolant through cooling towers. 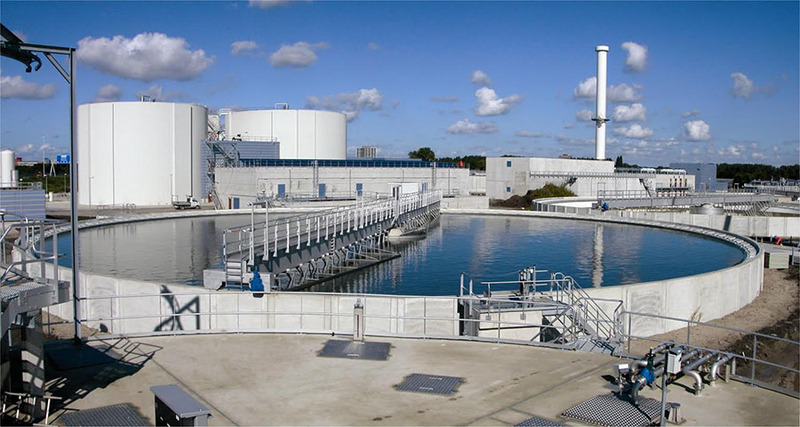 Sewage treatment unit with capacity 50 m3/hour. To produce pure water according to environmental laws to be used in garden irrigation inside the company .